It was a broadly bullish month for world equity markets, with net monthly changes ranging from +2.8% (France), +1.3% (USA - Dow), +1.0% (Germany), -1.6% (UK), to -2.1% (China). Mid term outlook remains bullish, with most markets set for another 10-15% of upside by year end. 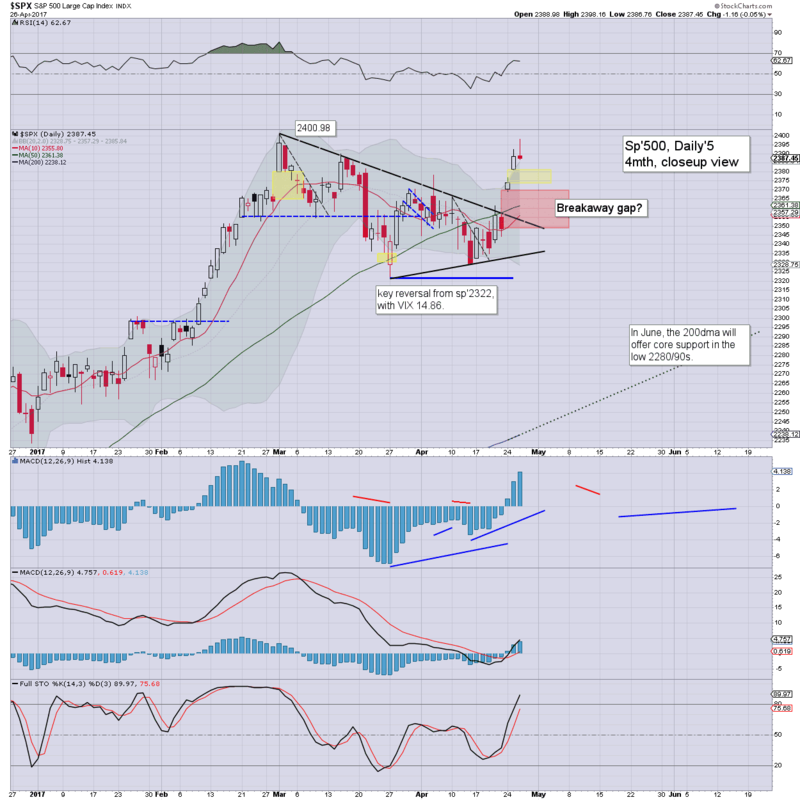 The mighty Dow climbed 277pts (1.3%), settling at 20940. Underlying MACD (green bar histogram) cycle ticked higher for a sixth consecutive month. The key 10MA will be close to the psy' level of 20k in May. Best guess: broad upside to new historic highs (>21169) in May, or certainly by mid June - when the Fed are set to raise rates again. 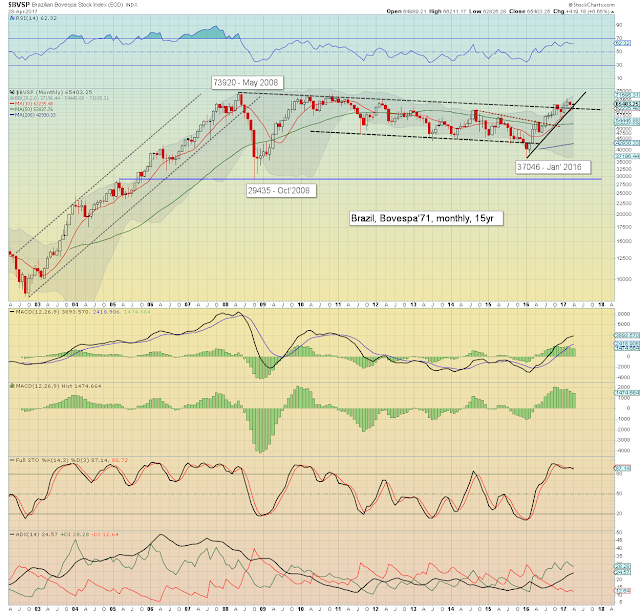 A year end close near 23k appears a very realistic target, which would equate to the sp'2650/700 zone. 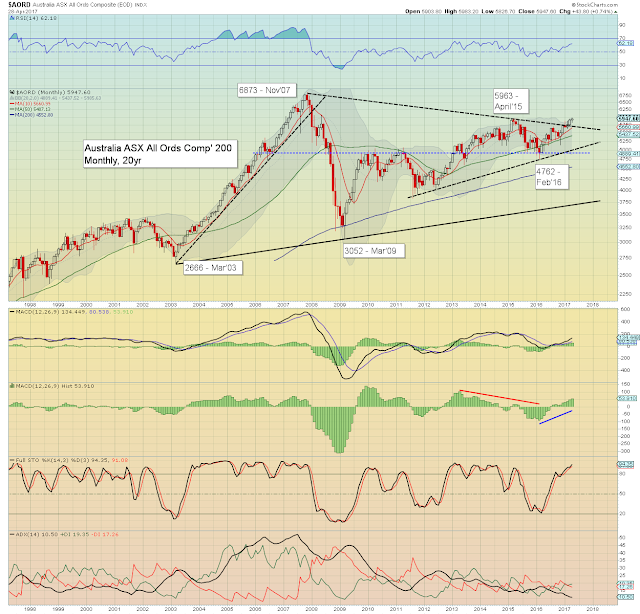 Equity bears have nothing to tout unless a break and monthly close under the key 10MA. The economic powerhouse of the EU - Germany, climbed for a fifth consecutive month, settling +1.0% at 12438. There was a decisive break above the April 2015 high, with a notable new historic high of 12486. The 13000s appear a realistic target this summer. The only issue is whether an acceleration in the upward trend to the 14000s by year end. 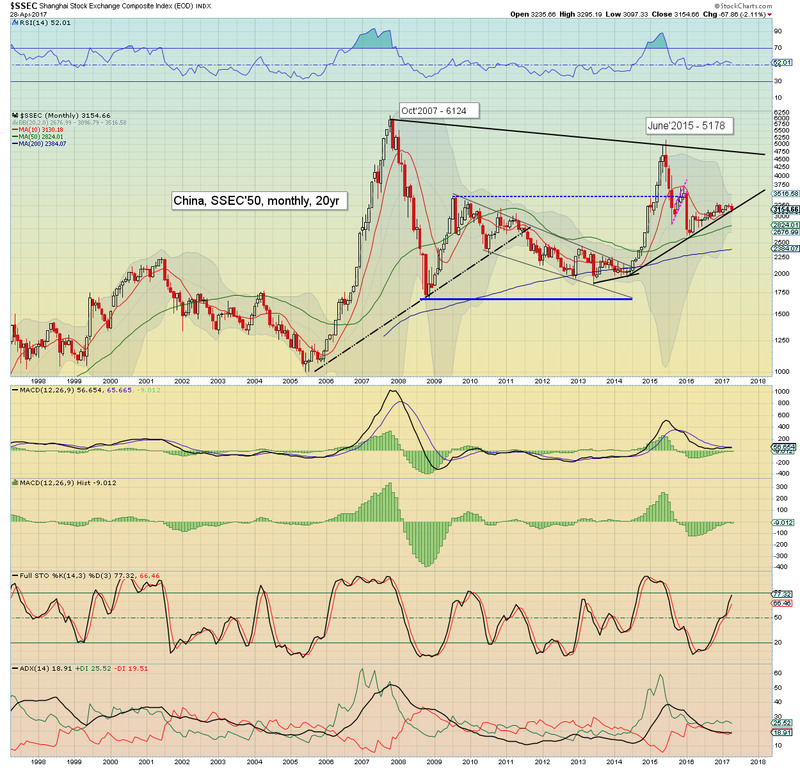 The BoJ fueled Nikkei saw some choppy price action, with an intra low of 18224, but settling +1.5% at 19196. 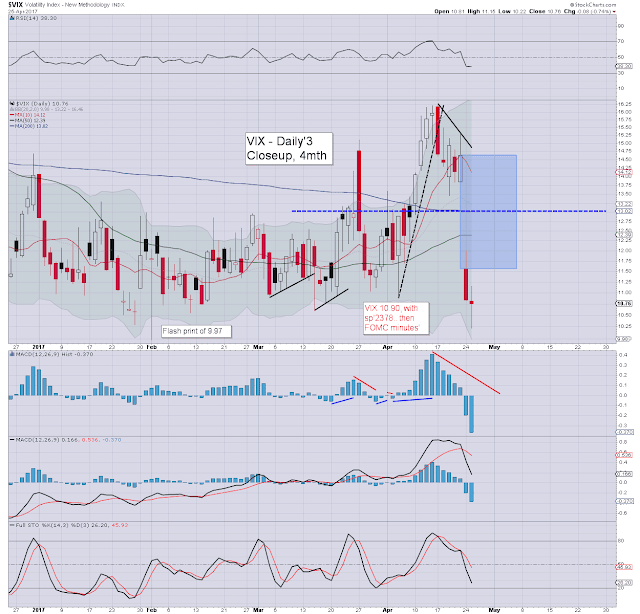 The monthly candle is pretty bullish, with a very spiky floor, indicative of further upside. First big target is the 20k threshold, and then the June 2015 high of 20952. 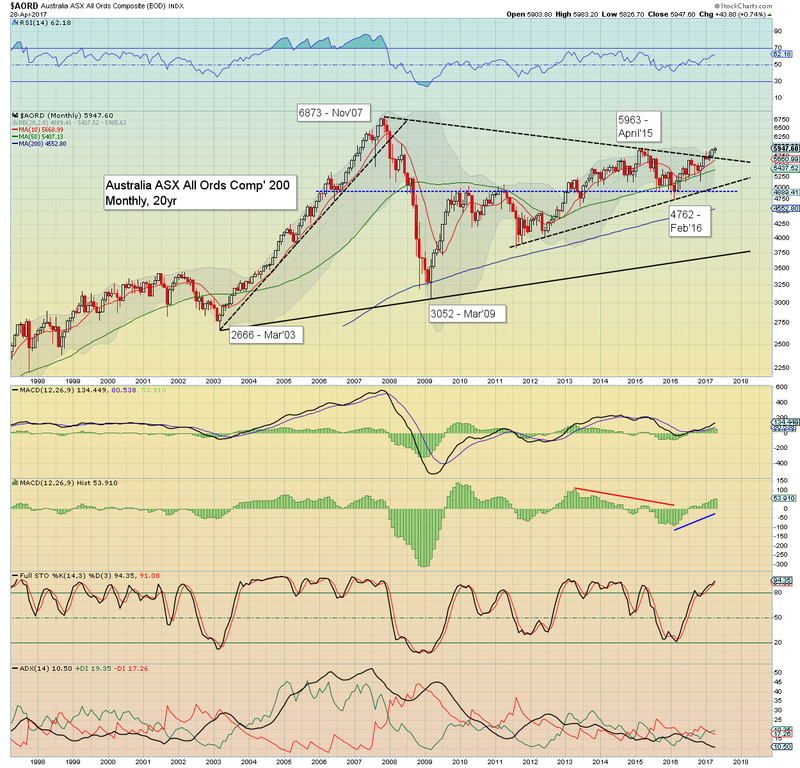 A year end close in the 21000s appears a valid target, as the global QE printing presses continue to spin. The Chinese equity market was the big laggard in April, with a net decline of -2.1% to 3154. Despite a weak close, this was still above the key 10MA, with price action having been choppy since the Nov'2016 high of 3301. Equity bulls need to see some price action >3300 to offer the 3500s, where the upper bollinger will act as strong resistance. 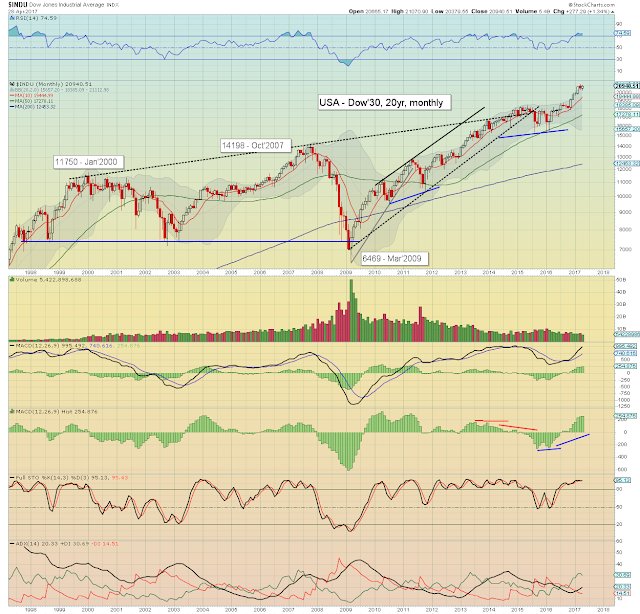 Any monthly closes >3600 will offer a powerful surge to challenge the June 2015 high of 5178, and right now, that is a massive 64% higher. 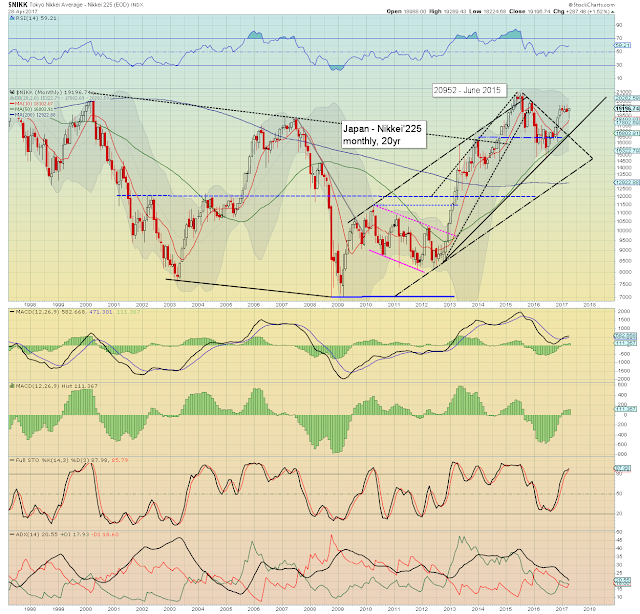 The Brazilian market saw a choppy month, settling moderately higher, +0.6% to 65403. 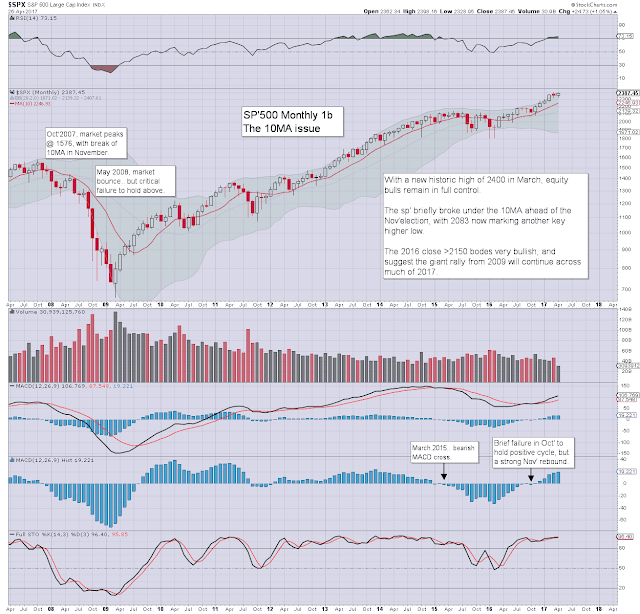 The April close was notably above the key 10MA, and the monthly candle was somewhat spiky, suggestive of further upside. Having already broken above massive multi-year resistance, first big target remains the May 2008 high of 73920, and that looks viable before year end. As ever, Brazilian equities will be particularly dependent upon commodity prices. It was a month of chop for Russian equities, with the RTSI settling net higher by 0.4% to 1119. Price structure since the Jan' high of 1194 is arguably a bull flag, which will be provisionally confirmed with any price action in the 1200s. Any break into the 1200s will offer grander upside to the 1500/1700 zone. The Russian market will be greatly swayed by oil/gas prices. The UK equity market saw a choppy month, leaning weak into end month, settling -1.6% at 7203. The surprise announcement of an election (June 8th'), is a temporary cloud over the market. The result is not an issue though, with the current ruling conservative party set to massively increase their control of the nation, who will then hold power into 2022. The 7k threshold - once multi-decade resistance, is now core support. 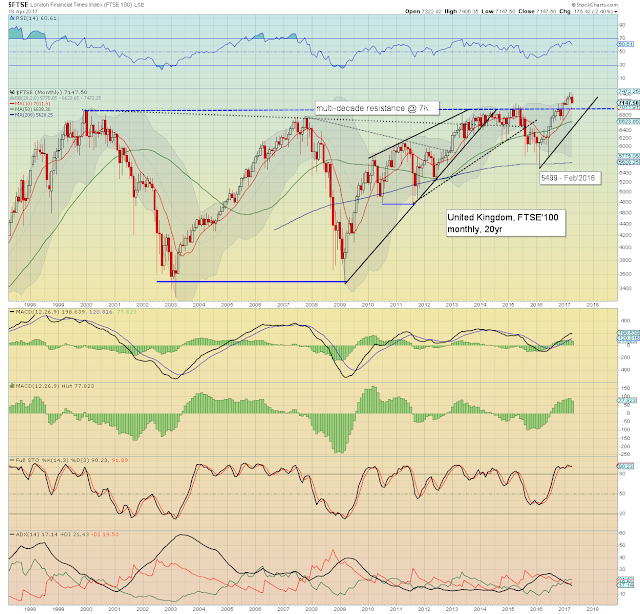 Considering other world markets, the FTSE'100 should be able to hold 7k, and push to new historic highs, whether in May, or shortly after the election. The 8000s look highly probable before year end. Talk of 'FTSE 10k' is valid. March saw a provisional break above multi-year declining trend/resistance, with the French market seeing a decisive breakout, +2.8% to 5267. Its notable that the intra high of 5296 broke the April 2015 high. 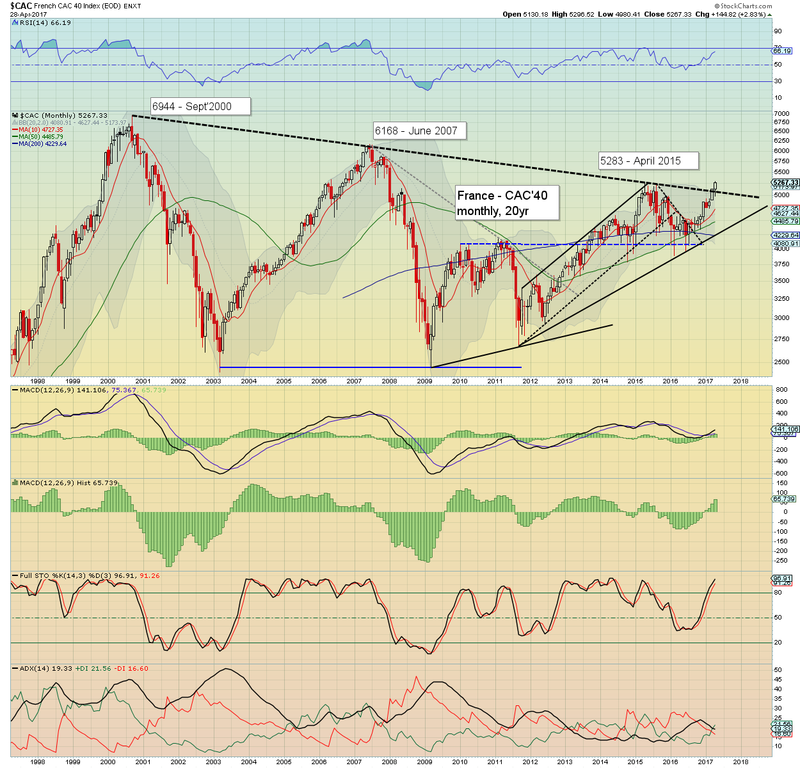 Next upside target is the June'07 high of 6168, which does appear highly probable before year end. As for the election - round'2, May 7th, it would seem Macron will win against Le Pen. Its increasingly difficult to see Le Pen seizing 1 in 2 of the French electorate. Even if there is a Le Pen victory, the equity outcome would arguably be much like the Trump event. Any initial weakness would be quickly reversed. Keep in mind the ECB printers are still spinning, as Draghi is extremely reluctant to tighten monetary policy. French equities are certainly benefiting from the new money, much of which is inevitably going to find a home within equities. 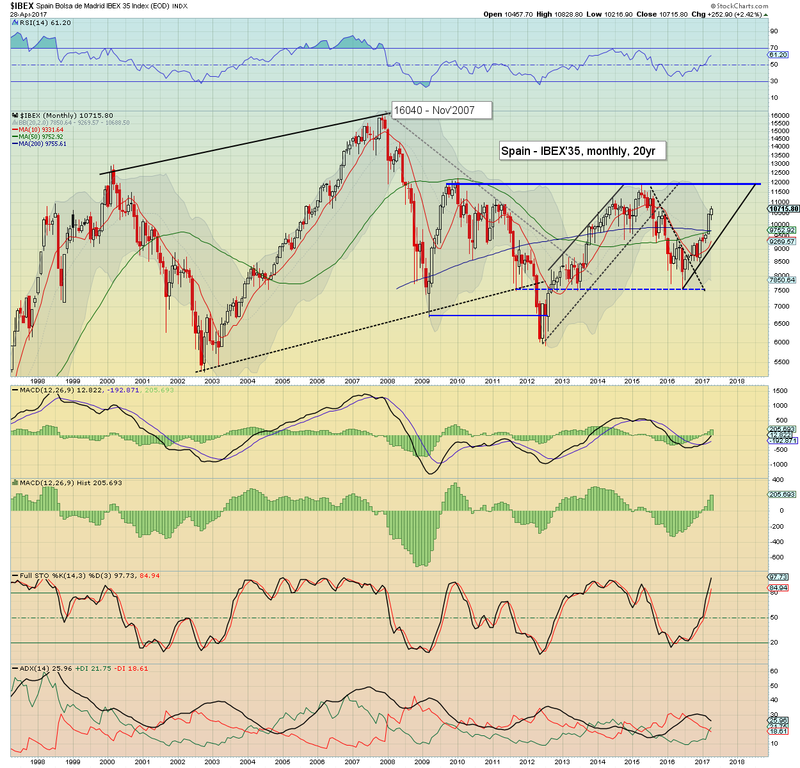 Spanish equities continue to power upward, with the IBEX climbing for a third consecutive month, +2.4% to 10715. First big target remains the 12k threshold, which is another 12% higher. 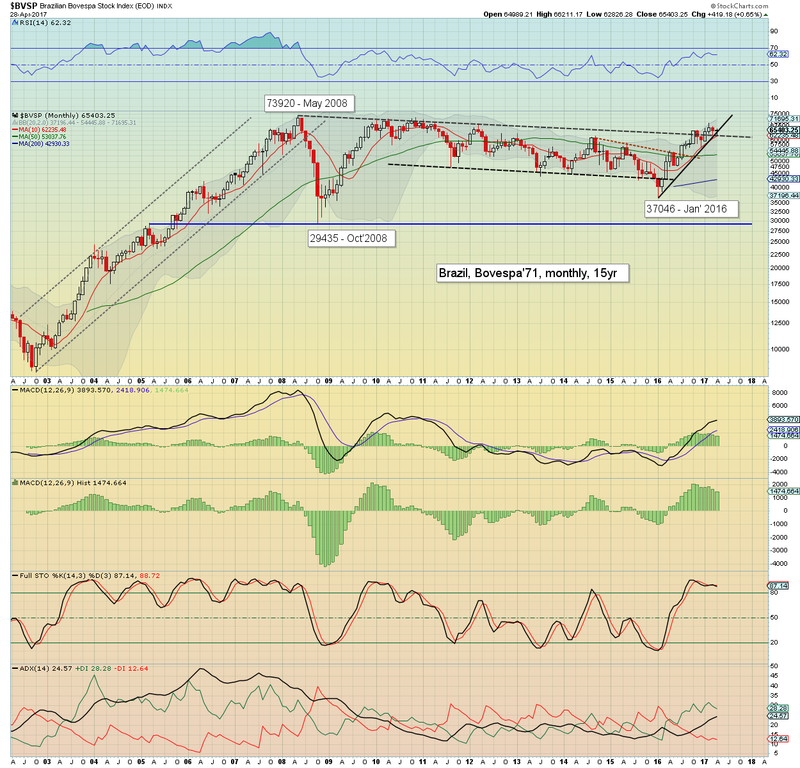 Any monthly closes >12k will offer 15/16k, before the rally that began in July 2012 from 5905, has a realistic chance to conclude.. The Australian market climbed for a third consecutive month, +0.7% to 5947. 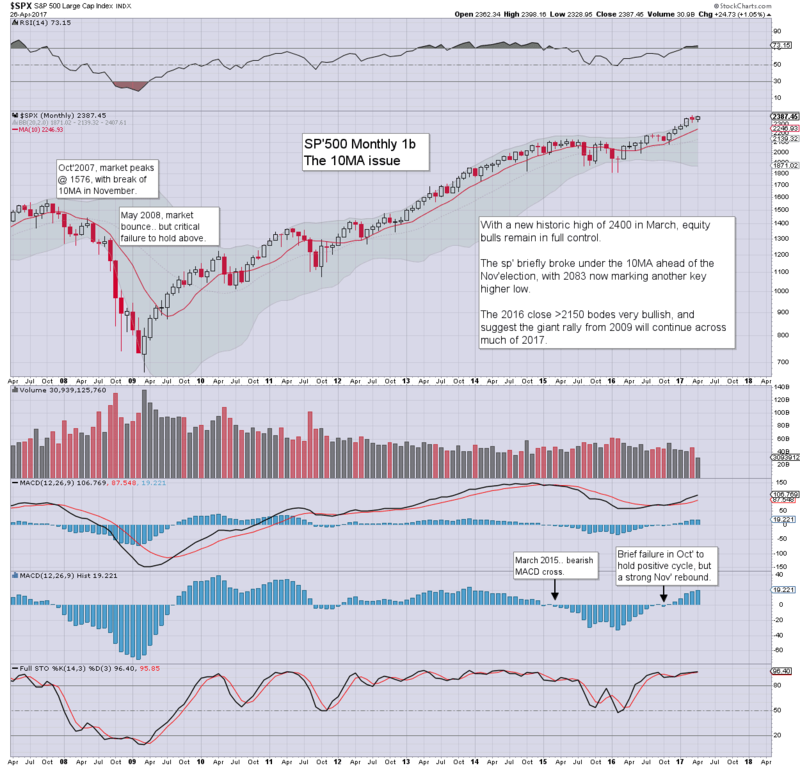 Its notable that the April 2015 high of 5963 was briefly broken, with an intra high of 5983. 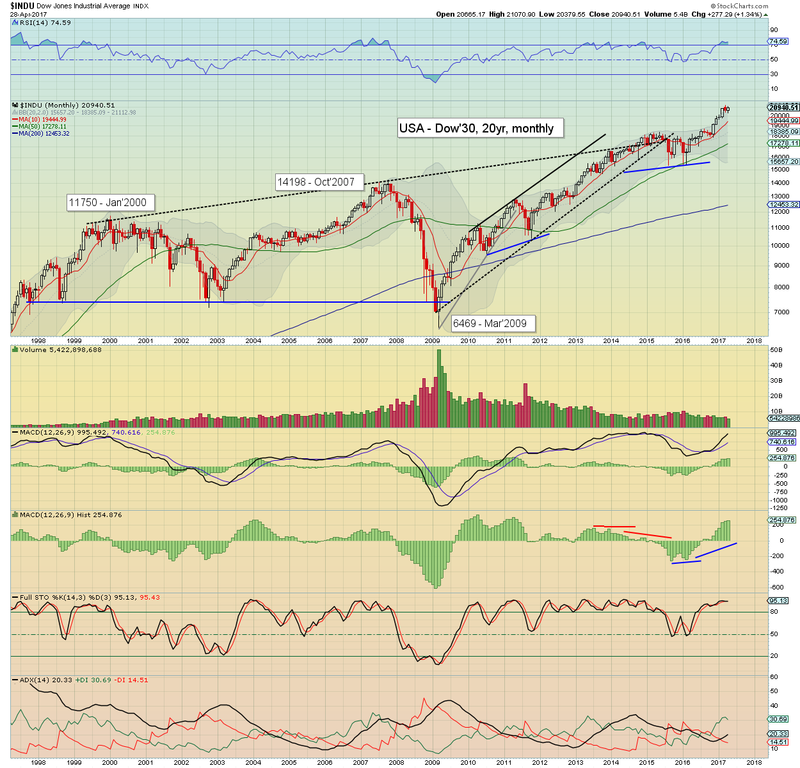 A monthly close >6K will offer a straight run to challenge the Nov'07 high of 6873. 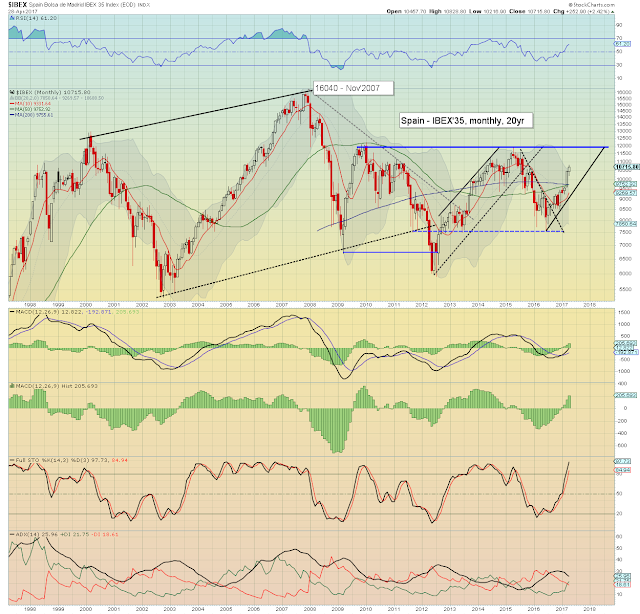 All world equity markets remain within mid/long term upward trends. 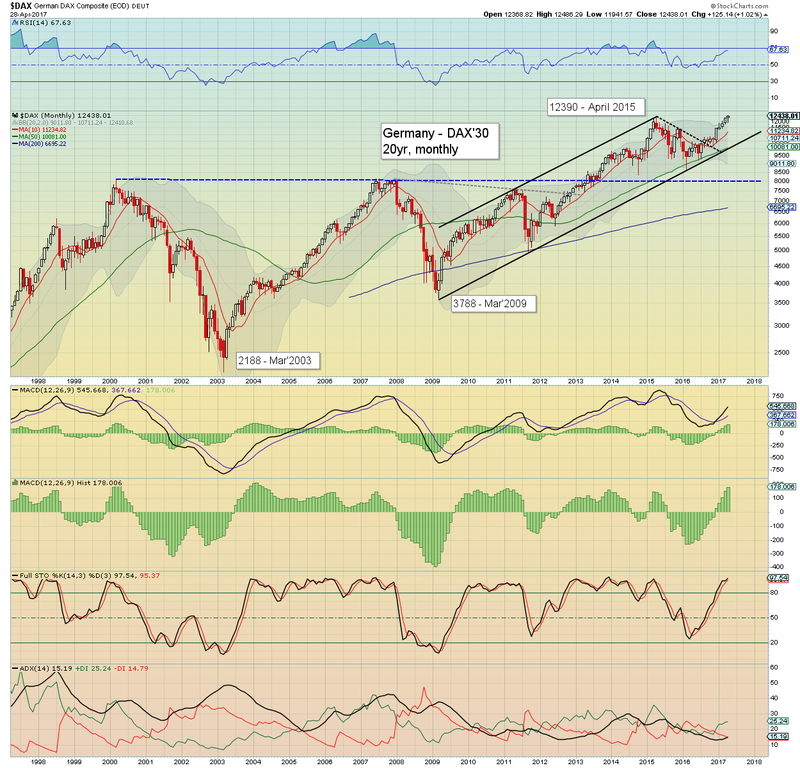 The German market was especially strong in April, seeing a new historic high. 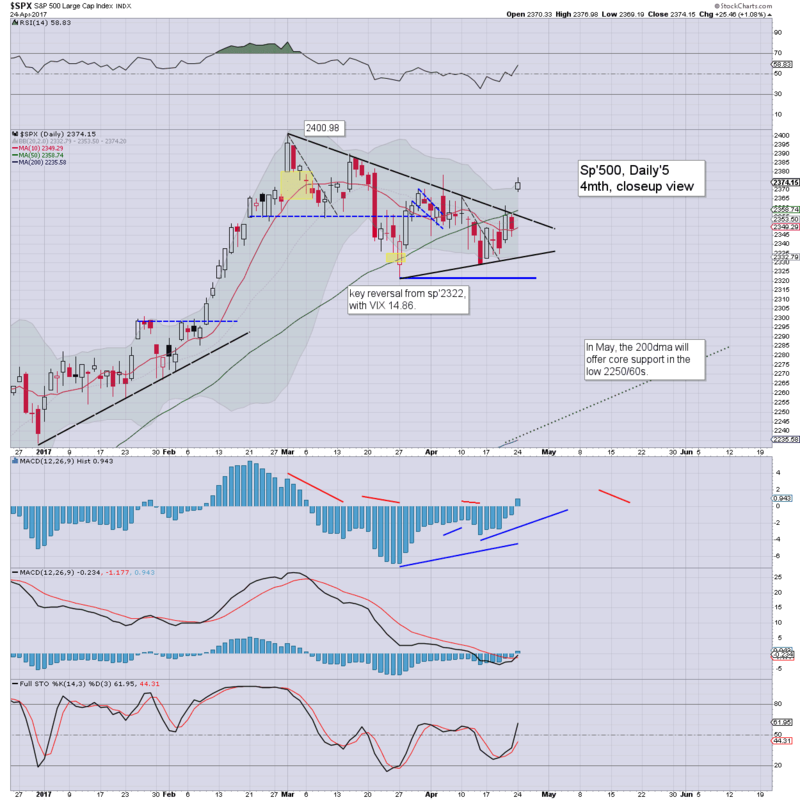 The breakouts in the French and Australian markets are extremely important, and have very bullish implications for other markets. Most markets look set to have a basic 10/15% of upside before year end. FOMC announcement @ 2pm. No change in policy is expected. There may be some chatter about reducing the balance sheet later this year. There will NOT be a press' conf'. F - monthly jobs, consumer credit. *there are a truckload of Fed officials set to appear on Friday, notably Fischer and Bullard - speaking at a monetary policy conf' in Stanford. If you value my work, you can support me via a monthly subscription. For $20pcm, you will get access to my continuing intraday posts, which total 220/240 a month. Or you could buy one share of AMZN in about 4-5 years time. US equity indexes closed broadly weak, sp -4pts at 2384. The two leaders - Trans/R2K, settled lower by -1.0% and -1.2% respectively. 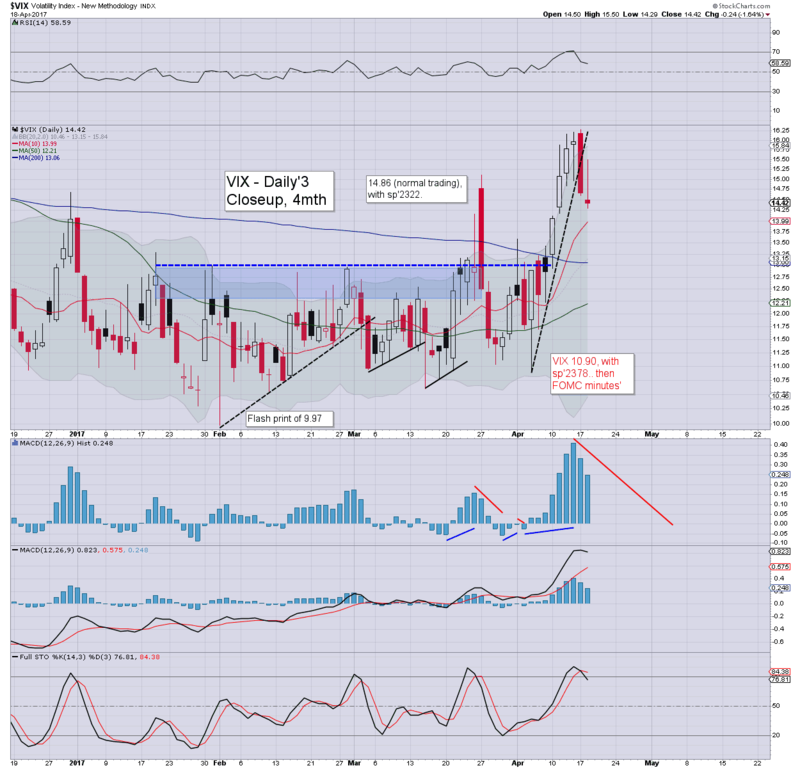 VIX settled +4.4% at 10.82. 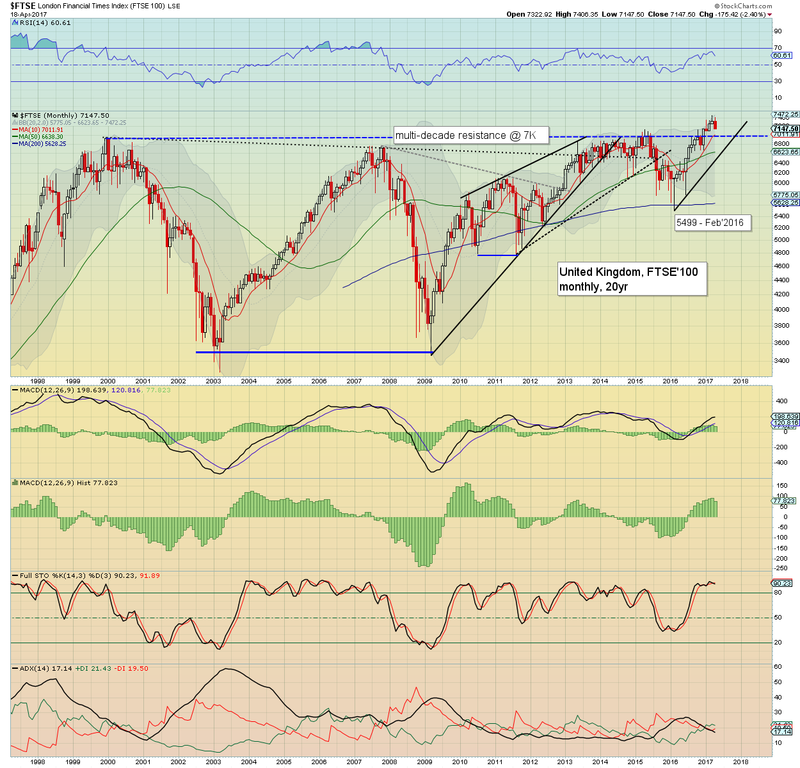 Near term outlook offers renewed upside into the sp'2400s, as corp' earnings and econ-data continue to come in 'reasonable'. It was a day of moderate chop for US equities, leaning on the weaker side. Its notable that the Nasdaq comp' managed yet another new historic high. The two leaders did close sig' lower, but they do tend to move twice the amount that the headline indexes do. Market volatility floored in the low 10s in the morning, and increased into the afternoon. 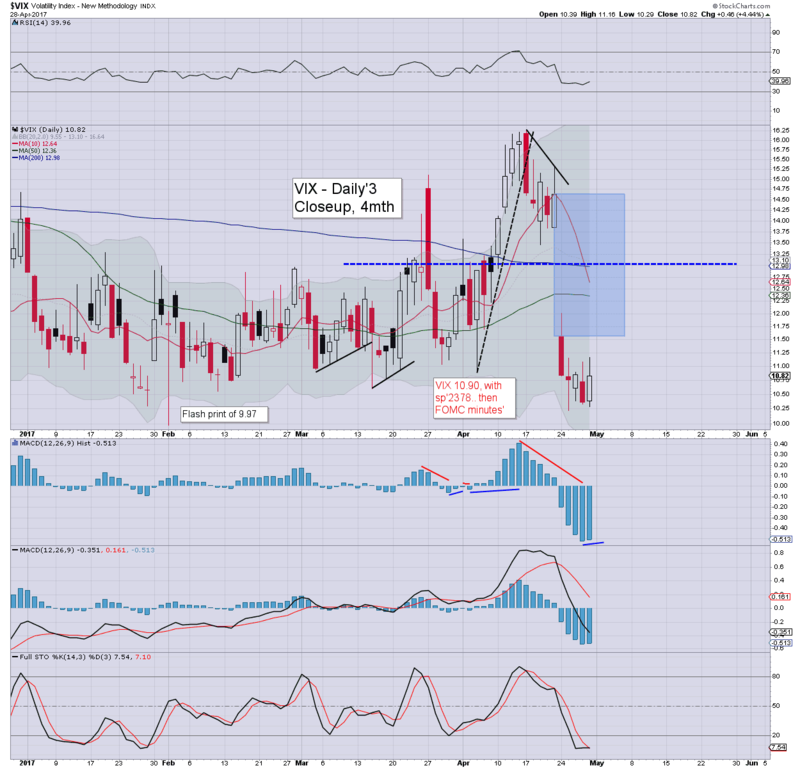 A brief foray to VIX 12 seems probable next Monday.. if sp'2374. The low teens look out of range until next Thurs/Friday. 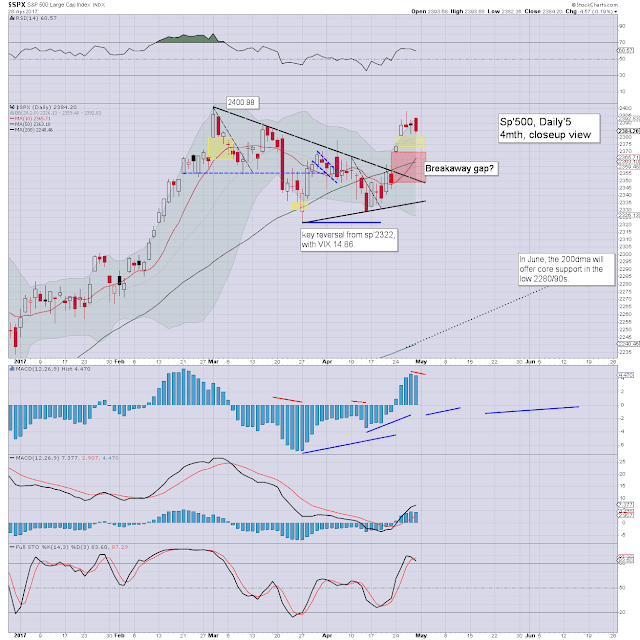 The sp'500 settled net higher by 21pts (0.9%) to 2384. 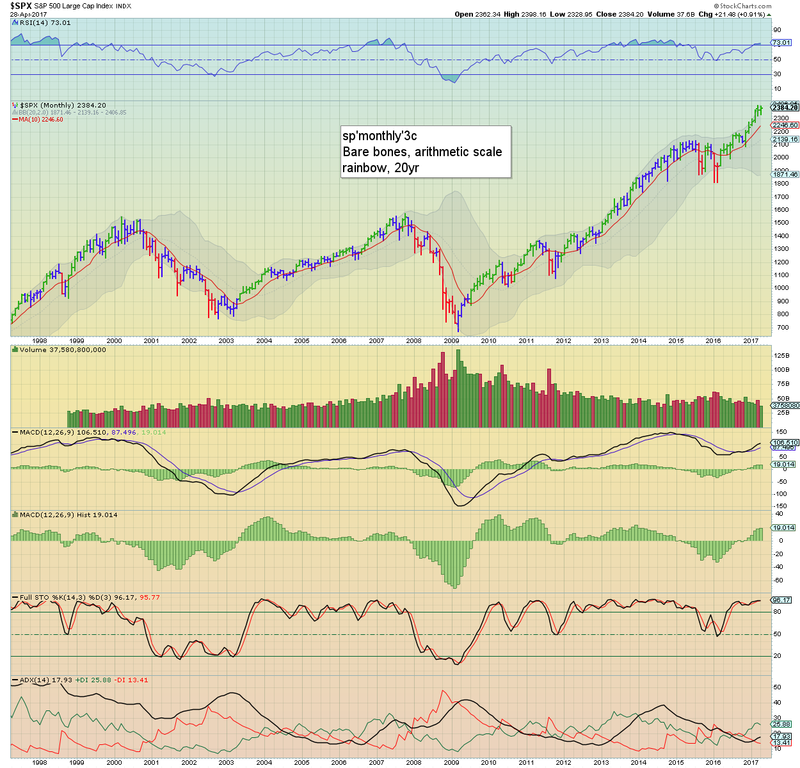 Most notable this month, new historic highs for the Nasdaq comp' and R2K. 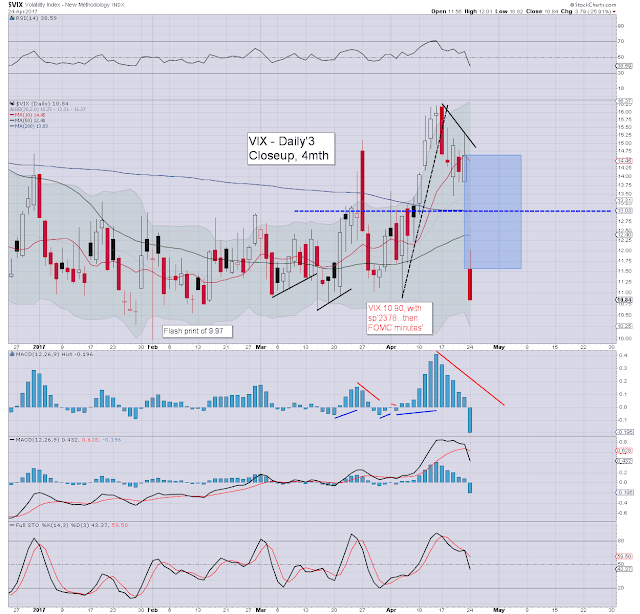 The sp' settled 5.8% above the key 10MA. At next Monday's May 1st open, that will jump into the 2270s, and will be around the 2300 threshold in June. This market is no fun ride for those still bearish. *the weekend post will appear Sat' 12pm EST, and will detail the World monthly indexes.... and it remains my most important post each month. US equity indexes closed moderately mixed, sp -1pt at 2387. The two leaders - Trans/R2K, settled -0.9% and +0.6% respectively. VIX settled +0.8% at 10.85. 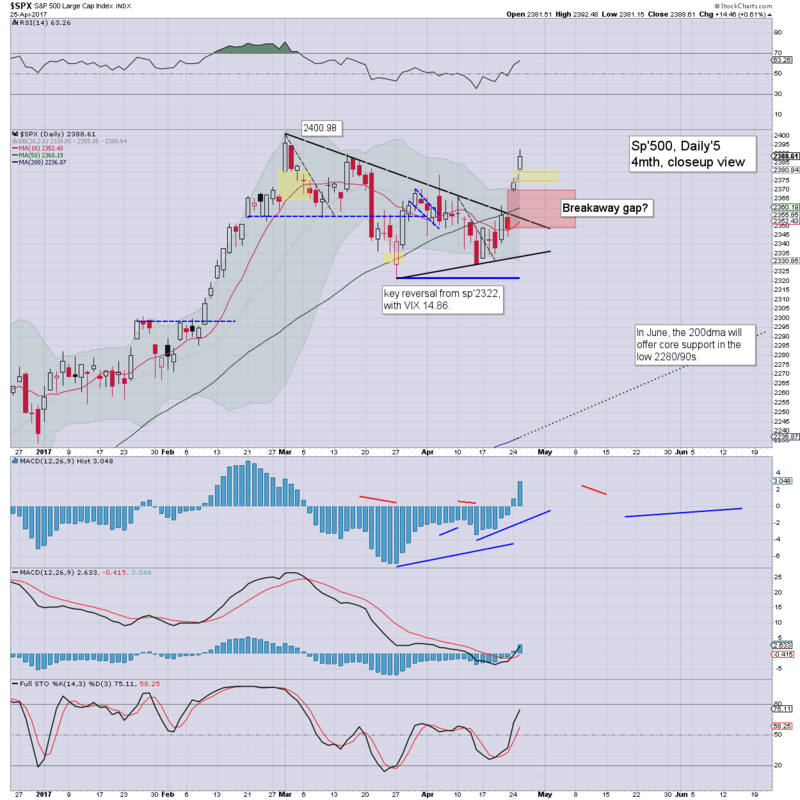 Near term outlook offers continued upward grind, as the equity bears are being systematically short-stopped with new historic highs. It was a pretty choppy day, arguably as the market was mostly just consolidating the past two days of gains. 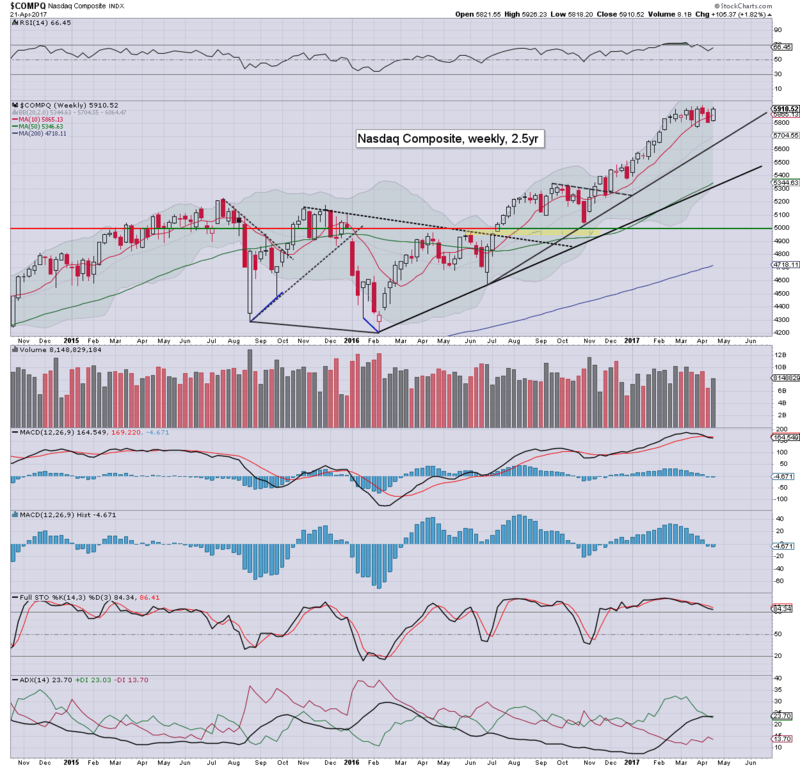 It was notable that the Nasdaq comp' (6040) and the R2K (1425) both broke new historic highs. Volatility remains extremely subdued, as the US equity market is set to end the month on a positive note. The key VIX 20 threshold looks out of range until at least Sept.
With two trading days left of the month, all US equity indexes are set for at least moderate net monthly gains. Most notable, the 10MA - currently at 2246. At next Monday's open it will be in the 2270s, and as of June 1st... around the 2300 threshold. Equity bears have NOTHING to tout unless a break AND monthly settlement under the 10MA. I recognise some of you like the 13MA.. or something similar. In the scheme of things, it makes little difference. For now, the mid term bullish trend remains comfortably intact. US equity indexes closed broadly higher for a second consecutive day, sp +14pts at 2388. The two leaders - Trans/R2K, settled -0.4% and +0.9% respectively. 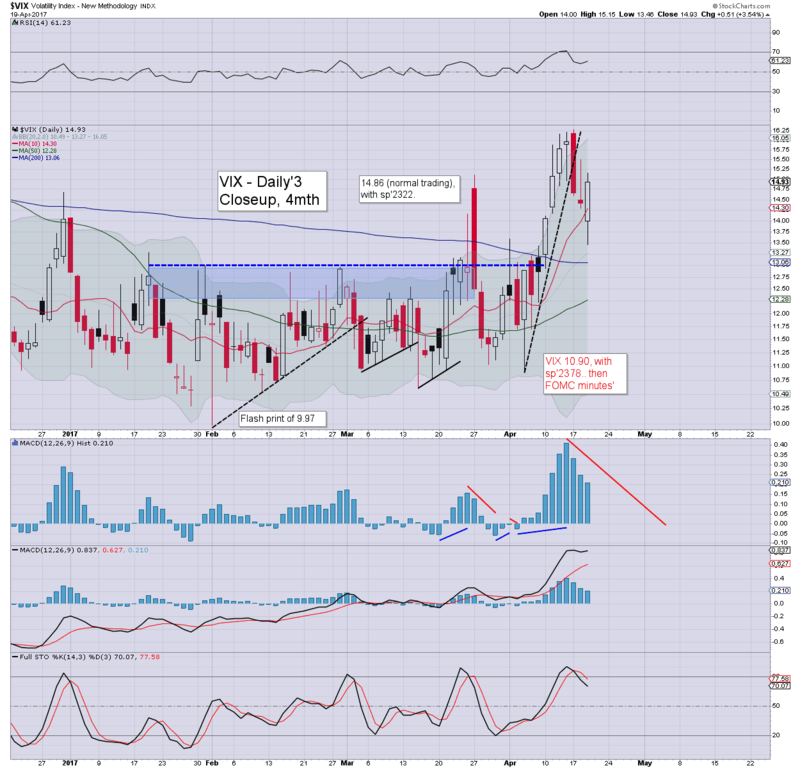 VIX settled -0.7% at 10.76. With the Nasdaq and R2K at new historic highs, the sp', dow, and others.. are set to follow. 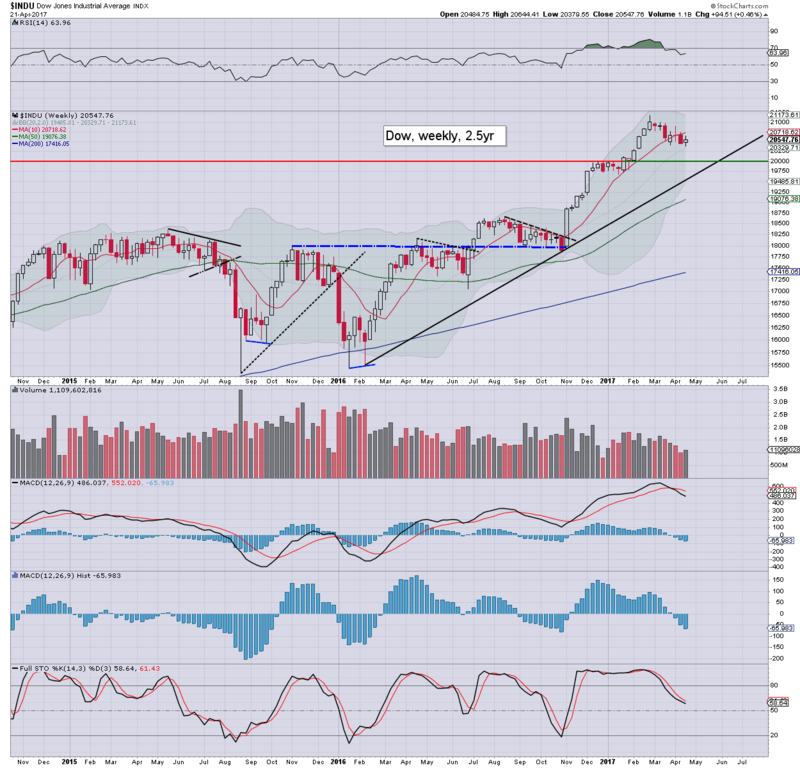 It was another day for the equity bulls, with new historic highs for the Nasdaq comp' (6036), and the R2K (1415). 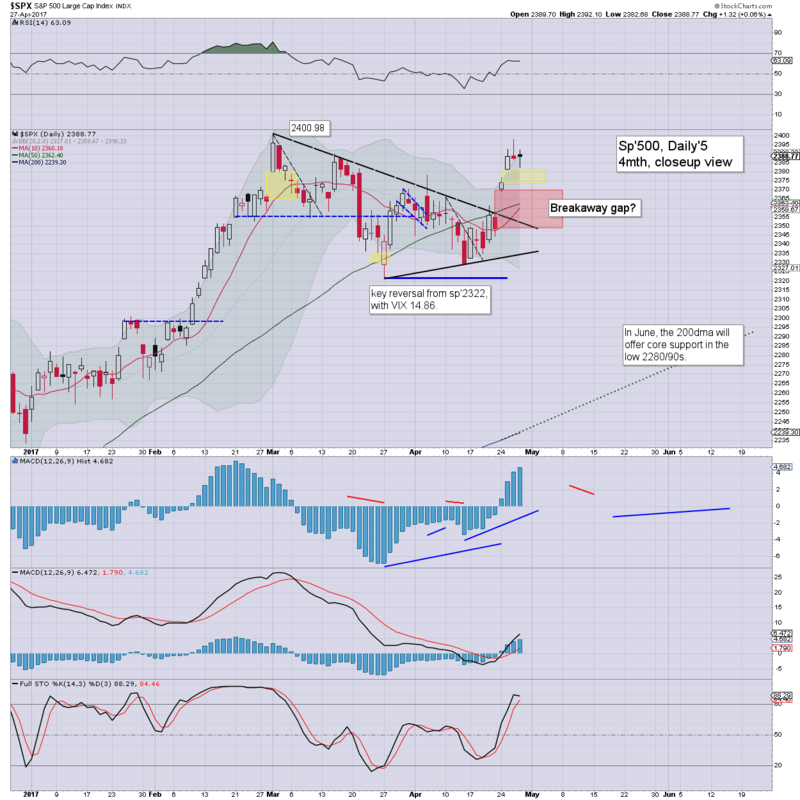 For the sp'500, the closing hour break above big resistance of 2380/90 was very significant, and offers a monthly close around the 2400 threshold. 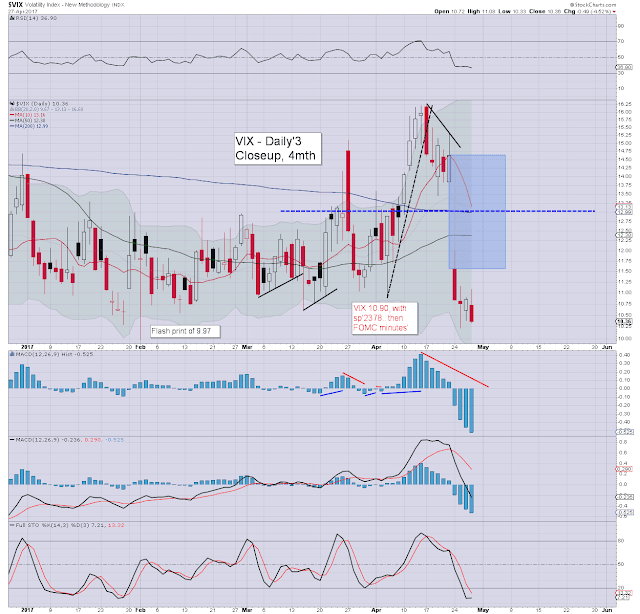 Volatility was itself choppy, and notably saw a new cycle low of 10.22. The key 20 threshold looks out of range for some months. Blustery... cold.... sleet/snow/hail.... its not summer yet. US equity indexes closed significantly higher, sp +25pts at 2374. The two leaders - Trans/R2K, settled higher by 1.6% and 1.3% respectively. 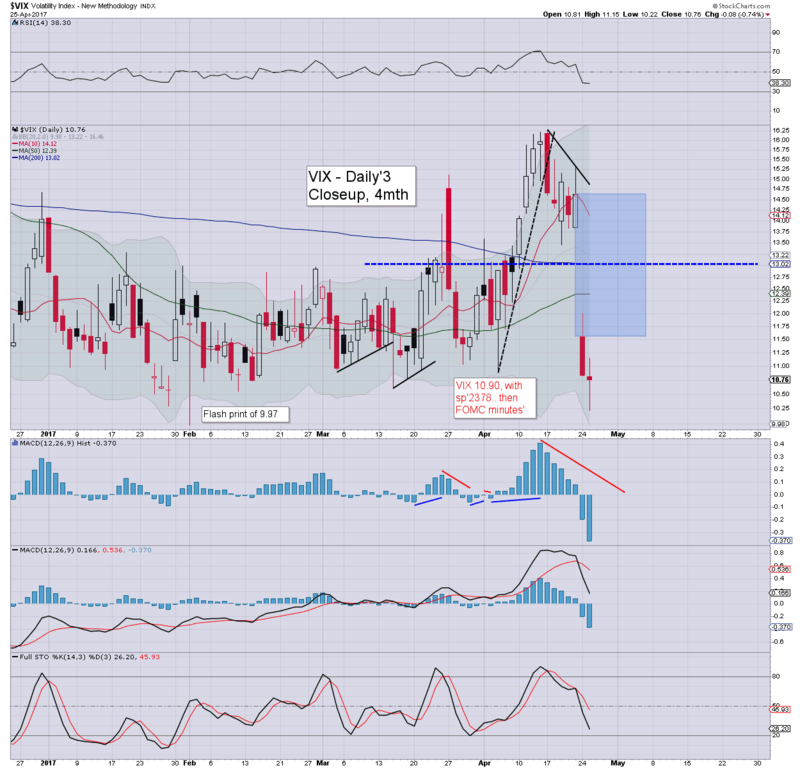 VIX settled -25.9% at 10.84. Near term outlook offers a few days of consolidation chop, but as things are, US equities are now set for net monthly gains. With the market believing that 'President Macron' is a sure thing (Sun' May 7th), most world markets jumped significantly higher. Today saw the sp'500 approach big resistance of 2380/90. 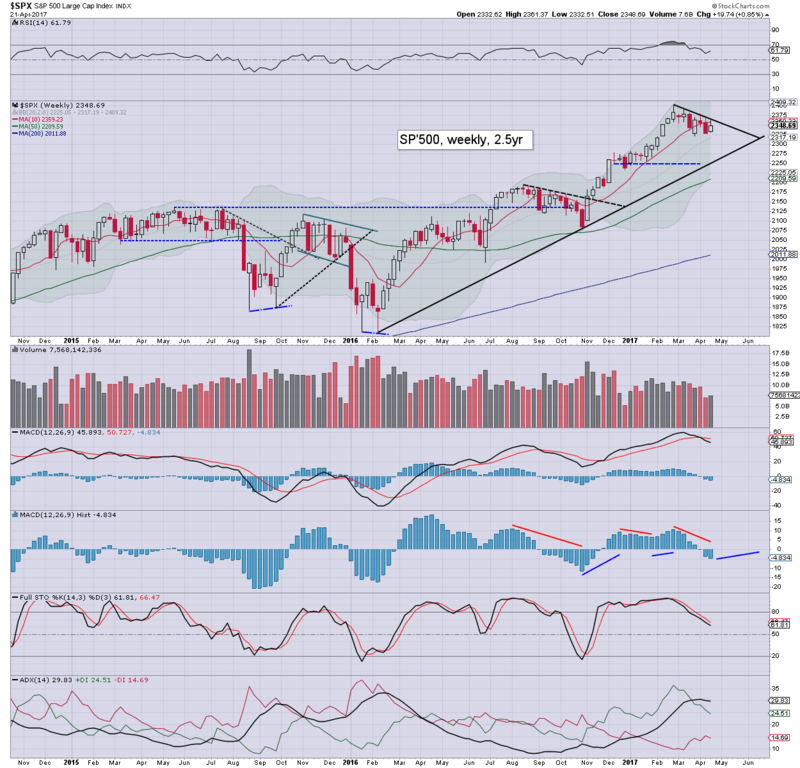 Regardless of any near term consolidation/chop, it does look like we'll see most indexes settle net higher for April. 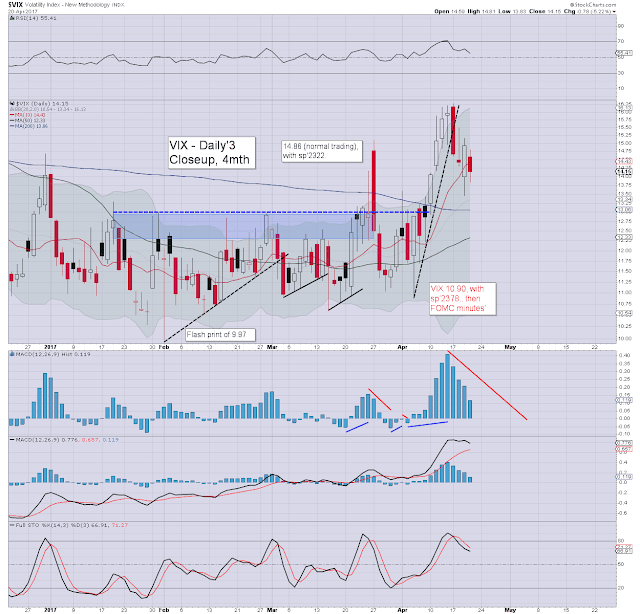 With the election uncertainty out of the way, volatility collapsed, with a somewhat incredible daily close in the VIX 10s. Does anyone really think the key 20 threshold is viable any time soon? I recognise some (perhaps many) of you don't much care, but the implications for other markets - including the US are undeniable. The German DAX broke a new historic high today, the door is now open to 14/15k. The French market naturally saw the most powerful of gains... breaking the 2015 high. A push to the 6000s is now on the menu, whether by year end or early 2018, it really makes no difference. It was a bullish week for US equity indexes, with net weekly gains ranging from 2.9% (Trans), 1.8% (Nasdaq comp'), to 0.5% (Dow). Near term outlook offers chop into end month, with a more viable break to new historic highs in the sp'2400s, after the French election is out of the way. Despite some moderate Friday weakness, the sp' managed a net weekly gain of 19pts (0.8%), to 2348 - just over 2% below the March 1st historic high of 2400. Underlying MACD (blue bar histogram) ticked lower for a seventh consecutive week. The key 10MA remains short term resistance around 2359. 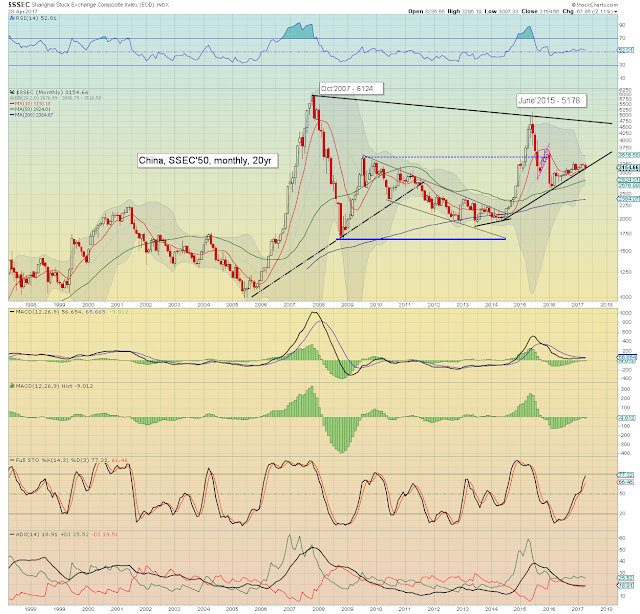 Its notable that core rising support in early May will be around 2260, and will rise to 2300 in early June. Best guess: an attempt to clear resistance of 2380/90 (but failing) into end April. A break into the 2400s appears far more viable after round two of the French election (May 7th). A June rate hike would help inspire upside to the sp'2425/50 zone. The 2500s look a stretch before Aug/Sept. The year end target of 2683 remains on track. Equity bears have nothing to tout unless a break of rising trend, and arguably (at minimum) a hit of the lower weekly bollinger, which is currently at 2225, and rising. 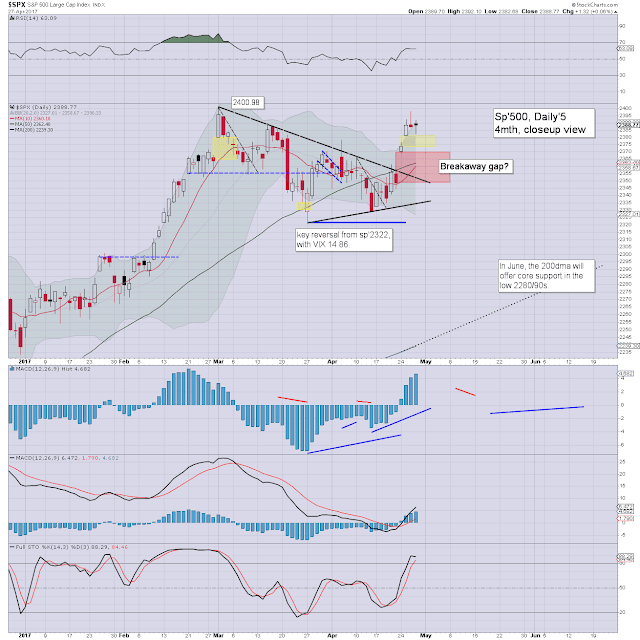 The tech settled net higher by a rather significant 1.8% to 5910. Indeed, the Nasdaq was just 10pts shy of breaking a new historic high. 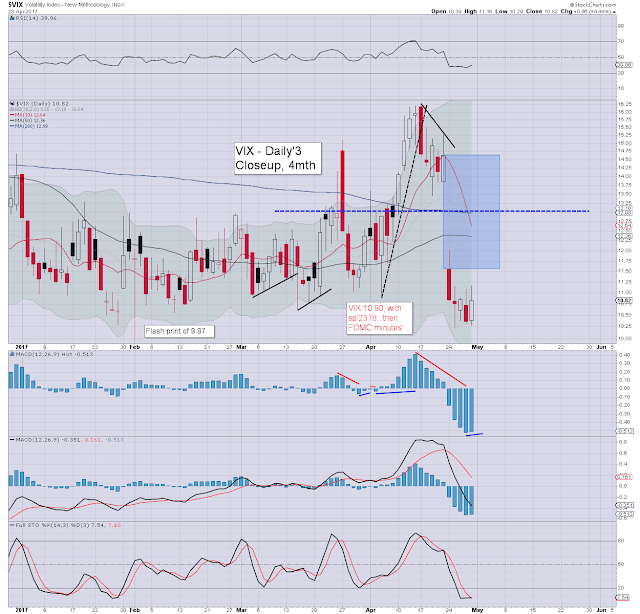 Upper weekly bollinger is offering the 6060s, the 6100s appear a valid target for May/June. 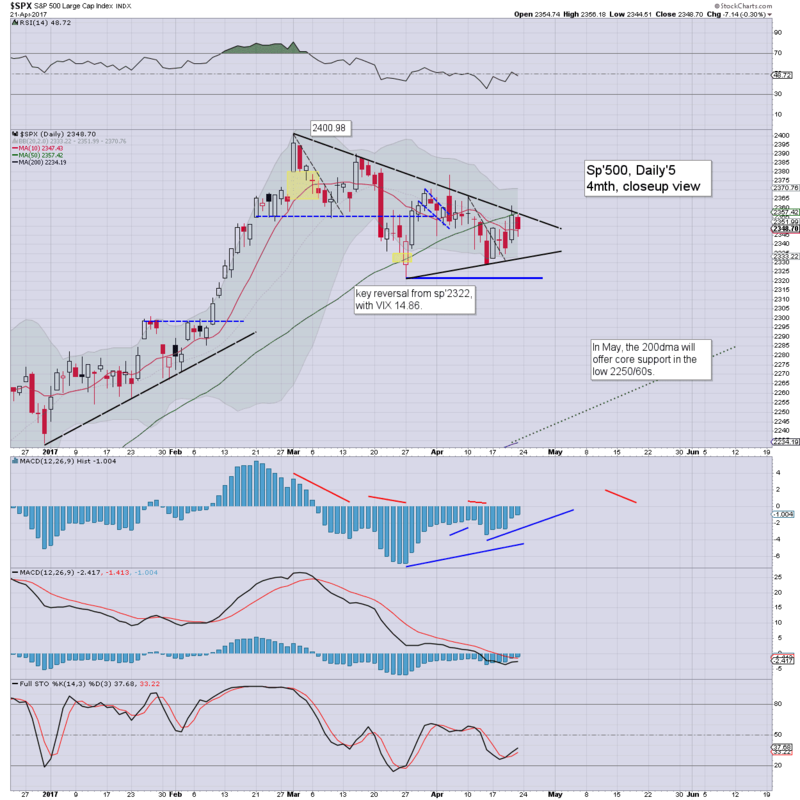 The mighty Dow was the laggard this week, managing a gain of just 0.5% to 20547. Things will turn short term bullish with a break >20800. 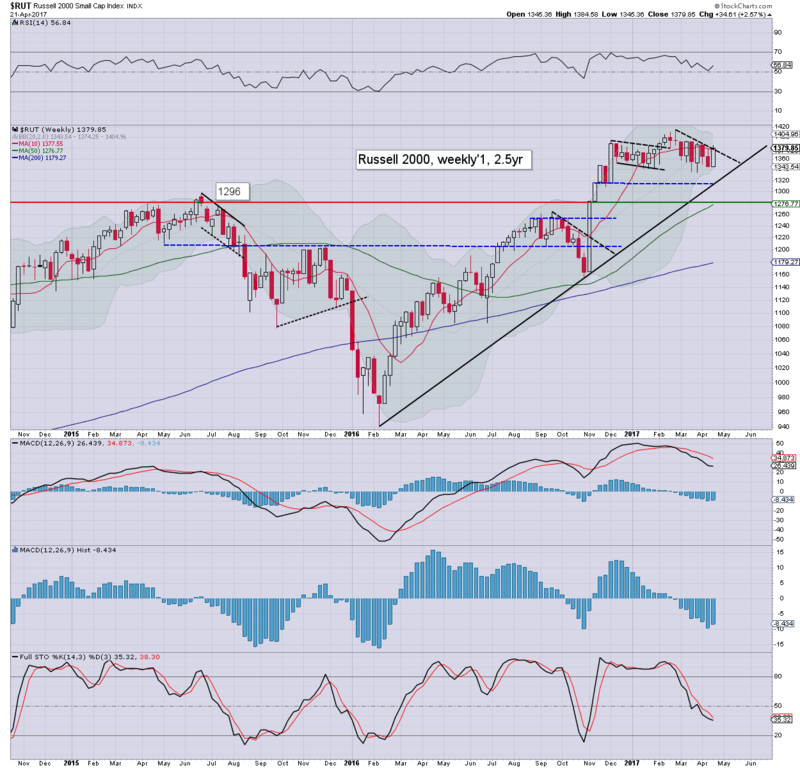 A push to the 21250/500 zone appears viable by late June. First big support is the 20k threshold, and this will intersect rising support in early June. 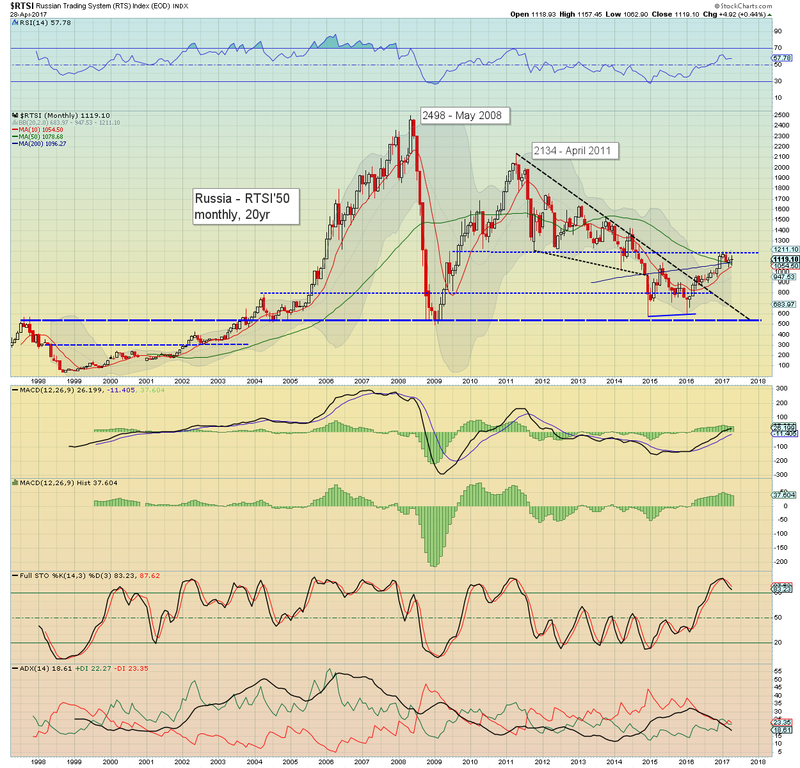 The Oct'2016 low of 17883 looks an awful long way down. The master index settled net higher by 0.6% to 11389. Price structure since late Feb' is arguably just a big bull flag. Bulls need a break above 11500 to provisionally confirm. 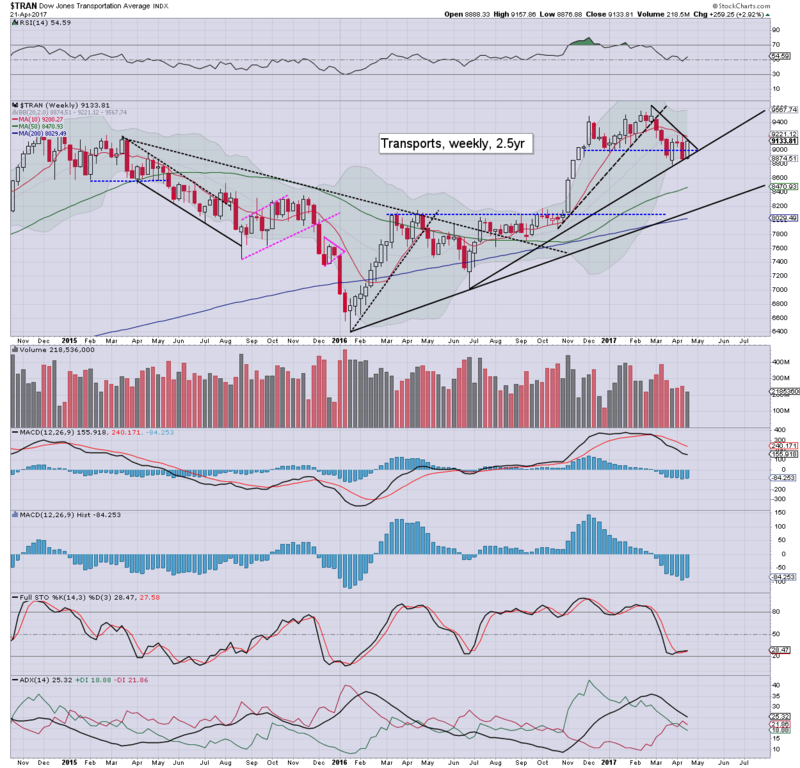 Things only turn bearish with a break below rising trend, which in mid June will be around 11400. 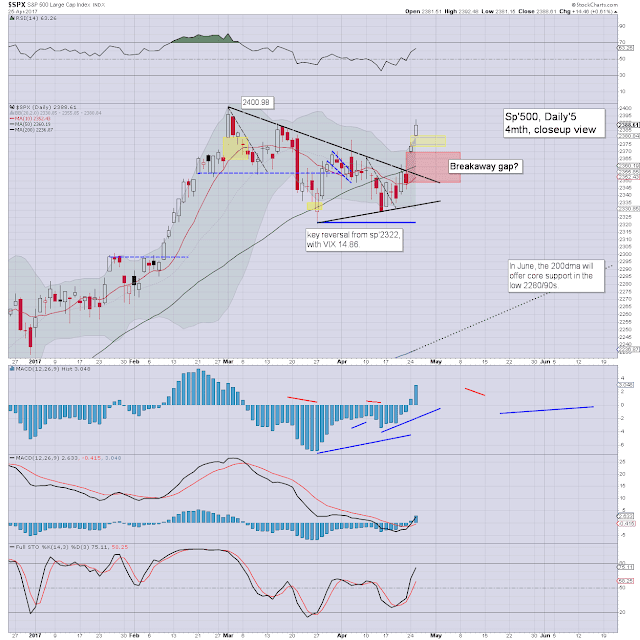 The second market leader - R2K, had a very bullish week, settling +2.6% at 1379. There was a fractional break of short term declining trend. Things turn decisively more bullish with a break >1400, and then the recent historic high of 1414. 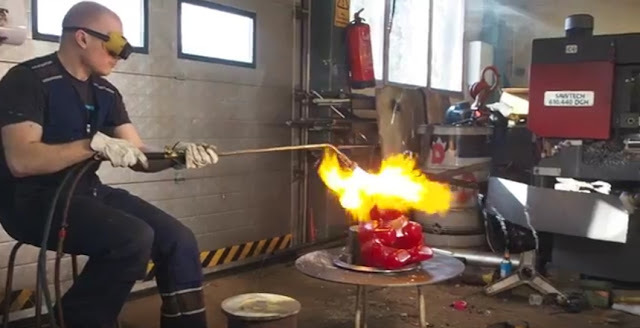 Its notable that the upper and lower bollingers are now very tight. A big move is probable. 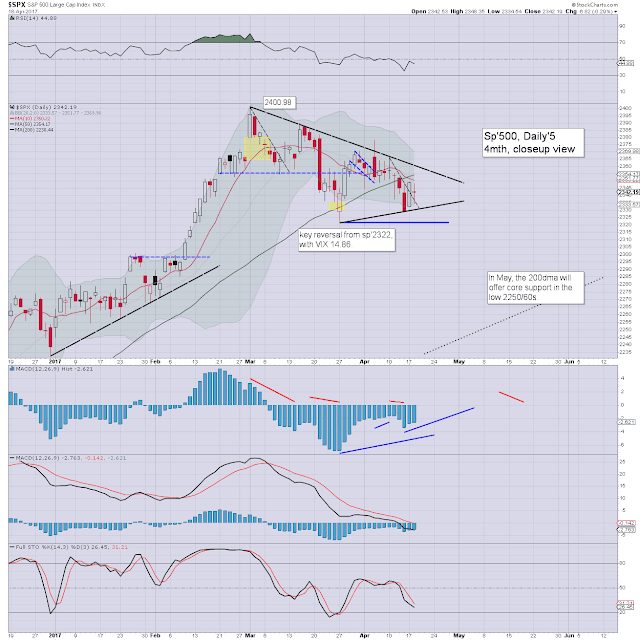 Cyclically, the R2K is on the very low side, and another up wave is likely to begin. The 'old leader' - Trans, is leading the way back upward, with a powerful net gain of 259pts (2.9%) to 9133. 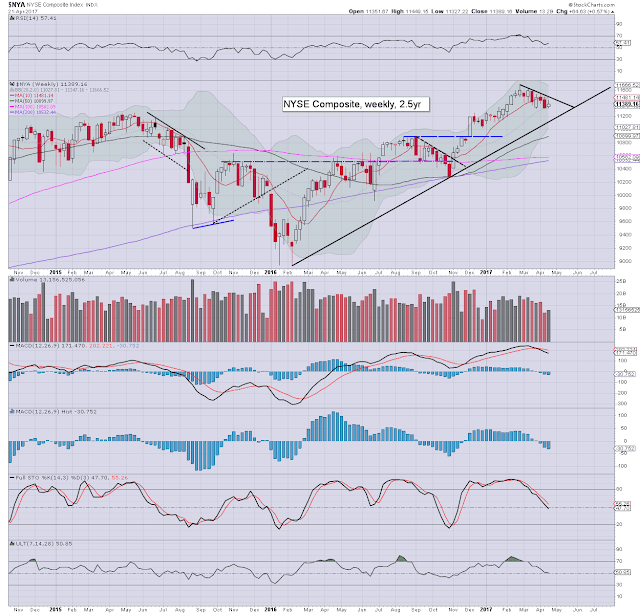 A break above the weekly 10MA in the 9200s next week would be rather bullish, and offer a run toward the upper bollinger in the 9500s. A grander move to 10k is on the menu... so long as the fed raise rates this June/July. Things only turn bearish if the March low of 8798 is taken out. Even then, that is still a long way above the Oct'2016 low of 7885. All US equity indexes remain near historic highs. The Nasdaq remains the strongest index, with the Transports still trailing. The mid term upward trend from early 2016 remains intact. Round one of the French Presidential election is Sun' April 23rd. The result should be known before the US market opens on Monday. A 'definitive winner' is extremely unlikely, and instead, a second round for the leading two candidates will be held Sun' May 7'th. Depending on the final pairing, its quite possible the market will be able to fathom who will become President. So... the Monday open could be rather dynamic. *Market consensus is expecting Q1 growth of 1.1%, which is indeed weak, but that has typically been the case for the first quarter. **there are just three fed officials scheduled. Neither of the trio are likely important, and it remains clear there will be no policy change at the next FOMC of May 3rd. *the next post on this page will likely appear Monday at 7pm EST. US equity indexes closed moderately mixed, sp -7pts at 2348. The two leaders - Trans/R2K, settled +0.1% and -0.3% respectively. VIX settled +3.4% at 14.63. Near term outlook is uncertain, and will be highly dependent on round one of the French elections this Sunday. Regardless of any near term geo-political scares, another big push to new historic highs remains due. 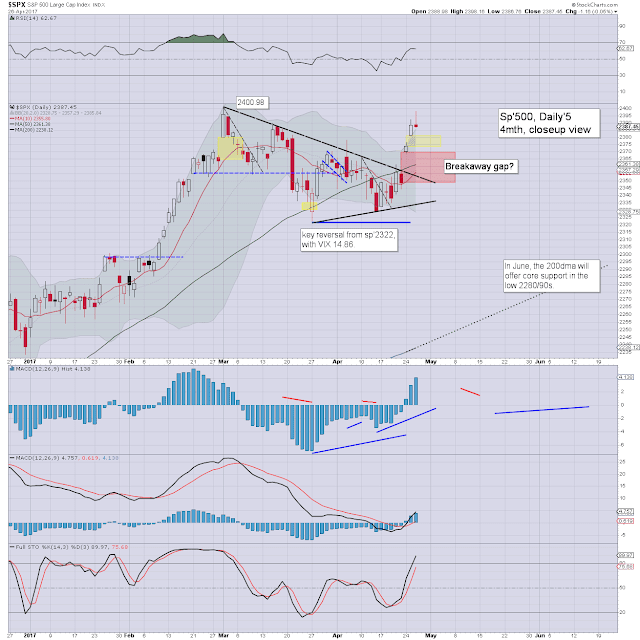 It was a rather natural opex, with the market makers almost managing an optimal close around sp'2350/ SPY 235.00. Volatility did lean a little higher, which is not surprising with the French election this Sunday. The key 20 threshold still looks out of range though, even if Le Pen is one of the top two candidates. US equity indexes closed broadly higher, sp +17pts at 2355. The two leaders - Trans/R2K, settled higher by 1.7% and 1.2% respectively. 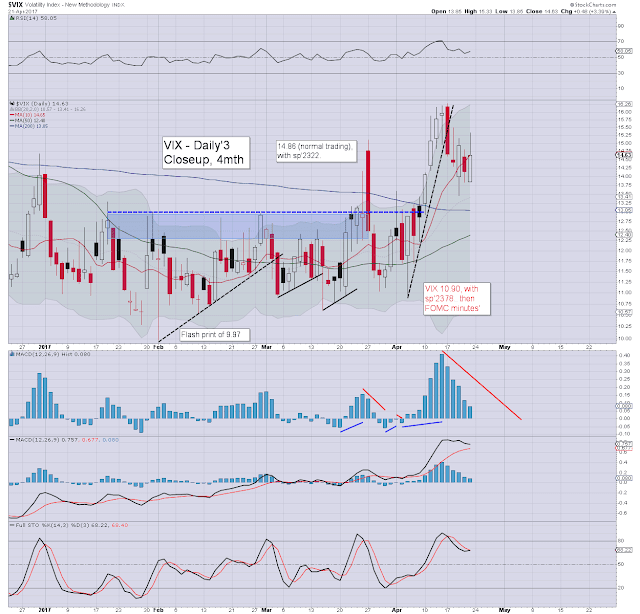 VIX settled -5.2% at 14.15. Near term outlook threatens a little weakness, with the market primed to settle opex/weekend around 2350. 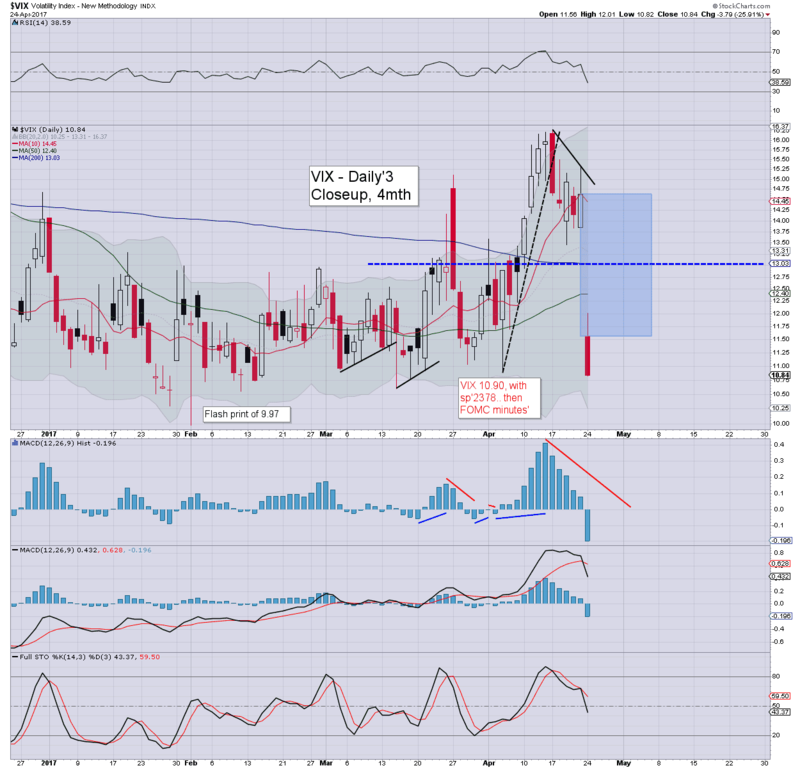 The moderate swings continue, with today seeing the market managing some broad upside. A minor gap of 2353/57 was filled, Mr Market washed out the sp'2360 short-stops, before some cooling into the close.. partly due to what appears to be another Paris terror attack. 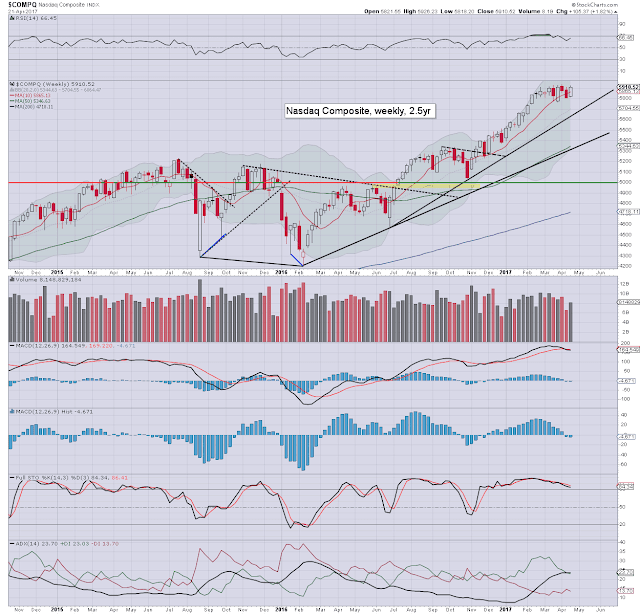 *Notably, the Nasdaq comp' is a mere 10pts from breaking a new historic high (5936). The 6000s are clearly within range before end month. 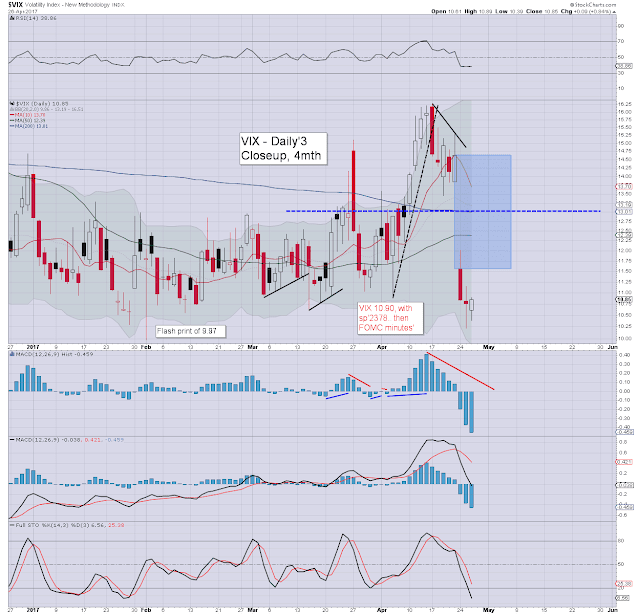 Market volatility remains naturally subdued... with the VIX back in the low 14s. The 13s are clearly viable tomorrow, but the 12s look out of range, as we have the uncertainly of round one of the French election this Sunday. US equity indexes closed moderately mixed, sp -6pts at 2342 (intra low 2334). The two leaders - Trans/R2K, settled -0.6% and u/c respectively. VIX settled -1.6% at 14.42. 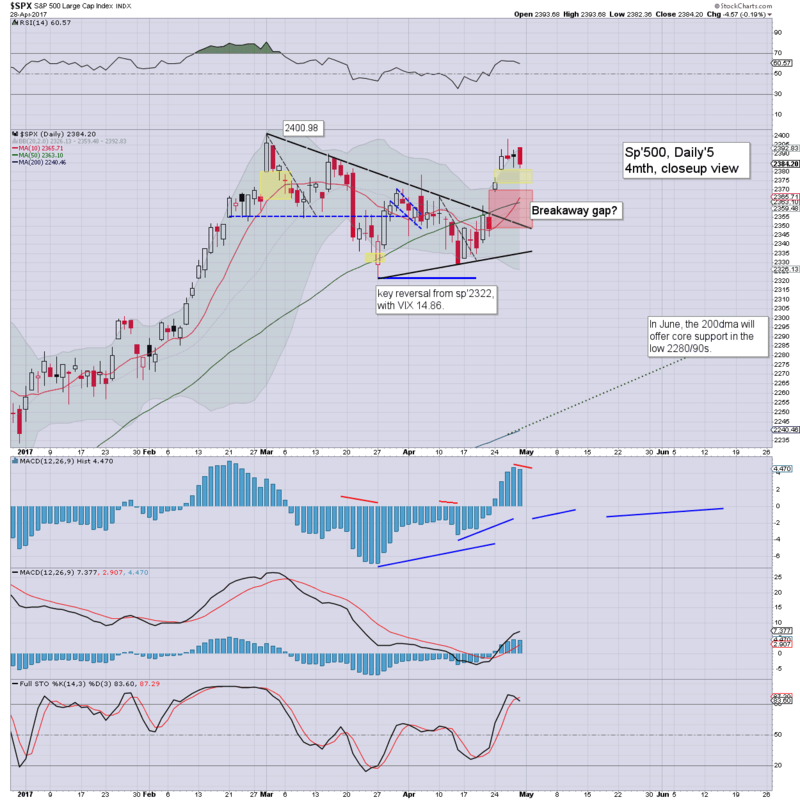 Near term outlook offers another moderate wave higher to the sp'2350/60s. 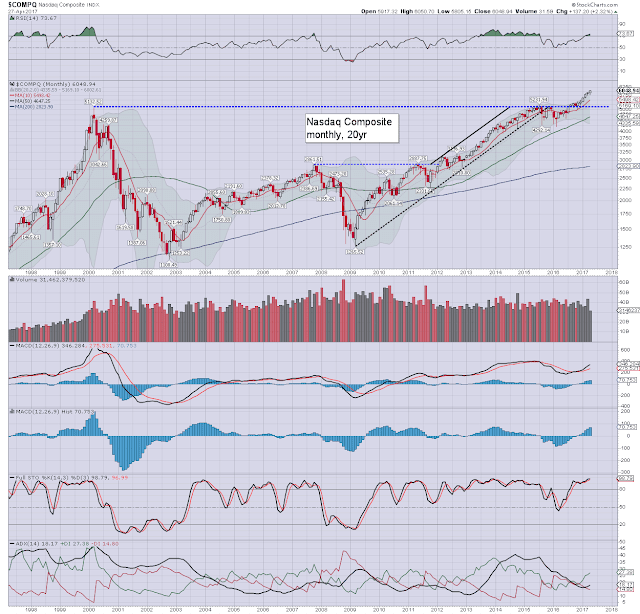 Broadly, a push to new historic highs in the 2400s now looks out of range until early May. US equities opened moderately weak, partly weighed by a (moderate) earnings miss from GS, but more so, the news of a UK election. An opening reversal failed to hold in early morning, with another wave lower to sp'2334. From there, a rather standard (if choppy) latter day recovery. 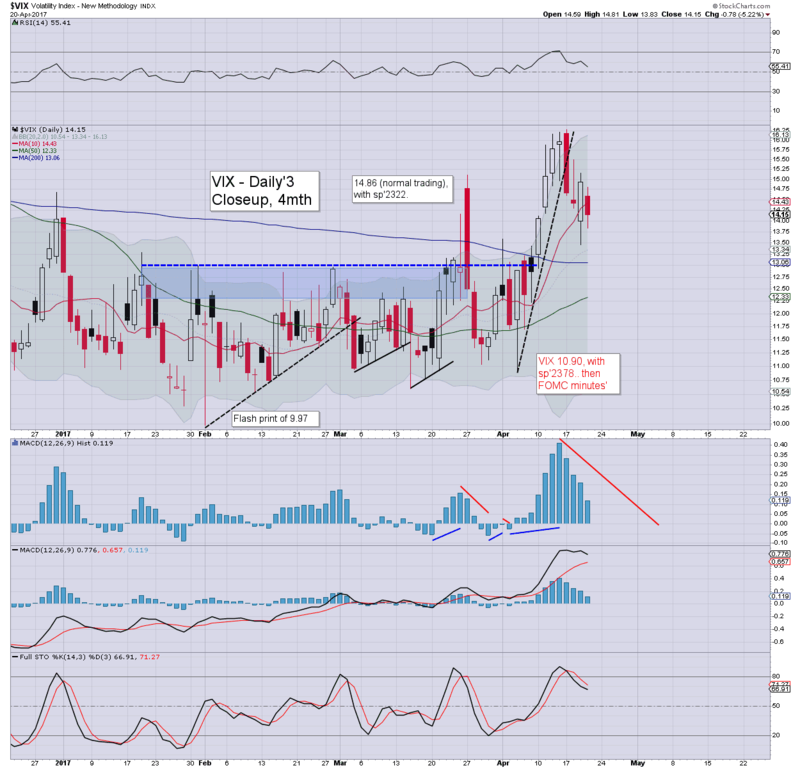 Volatility was itself choppy, and with a moderate equity recovery in the afternoon, even turned negative into the close. Seriously, its a very shrewd political move. The main opposition party 'Labour' (the UK version of the democrats), is deeply fractured, and are trailing in the polls by around 20pts. May* is seizing the opportunity to greatly increase her parliamentary majority, and safely 'bank' a further five years of power to summer 2022. Unlike the French elections, there is near zero doubt on the outcome of the June 8th UK election. Naturally - even though the result is clear, the UK equity/capital market will be somewhat clouded until the election is out of the way. Last year's break above 7k was massively decisive.That is now core support, and should hold into the June election. If you backwards extrapolate, you have to start from 10k before the next major decline can begin, and that is clearly not viable any time before late spring 2018. If you believe that, you should also recognise there are indirect implications for the US market. *I'm not suggesting May is on the level of a Sith Lord, but her voting pattern across the last decade is pretty dark sided.